Seamless pattern with coconuts and coconut cocktail, painted in watercolor. Seamless pattern with poppies. Hand-drawn floral background. Seamless pattern with soft cotton buds. Vector floral background. Rosemary isolated on white background. Vector, watercolor hand drawn illustration. Seamless pattern with marine rope and knots . Seamless black background with gray orchids. 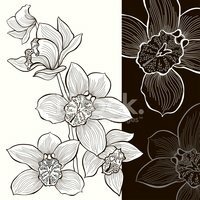 Monochrome seamless background with hand drawn orchids. Vector set of hand drawn orchid branches with flowers.